On assignment for VTDigger.org, I went to Stockbridge, Vt. last week to see the White River Valley Campground, which was almost completely destroyed when Tropical Storm Irene hit Vermont late August, 2011. Here’s that story. Rebecca Smith can’t stand the sound of rushing water. On Tuesday it will be a year since floodwaters from Tropical Storm Irene swept away much of the campground she ran with her husband, Drew, just off Route 107 in Gaysville, a village in the town of Stockbridge. Rebecca nearly drowned as she escaped the high water that engulfed their 22-acre property within a matter of minutes. This week as she stood in the barren floodplain of the White River among rocks – most of them far too large to have come from the campground fire pits the floodwaters washed away – she describes how she heard the boulders knocking against each other as the river, now quietly running through a shallow bed of sand and stone, raged on that Sunday night a year ago. Read the rest on VTDigger.org. After the June 20 death of a 39-year-old Vermont artist after he was tased by a Vermont State Police officer, I wrote a series and conducted an investigation of all incidents of Taser use by the Vermont State Police since the general uniform division was equipped with the weapons in 2011. After a three-hour standoff, Shaffer ordered Mason to lay face down on the ground in an attempt to take him into protective custody. Noticing Mason was unarmed, Shaffer lowered his patrol rifle and drew his Taser X-26, L’Esperance said. Mason, who L’Esperance described as being 6 feet tall and 195 pounds, began yelling and moving towards Shaffer, who began to fear for his safety and activated the Taser. Its electrical probes landed in Mason’s chest. 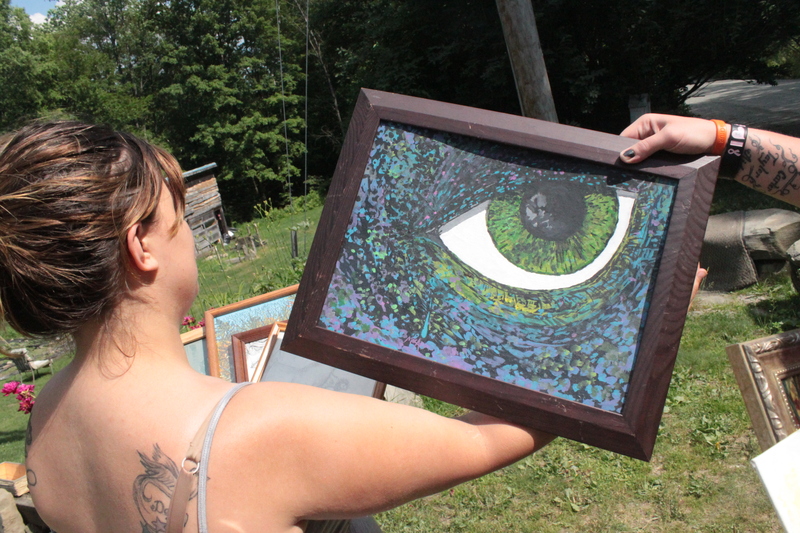 Artwork spills out of the small home on a dirt road a couple miles outside Thetford Center, where Theresa and Ariana Davidonis live. A wooden archway stands in front of the vinyl-sided home at the beginning of a stone path around the house to a patio, furnished with a small wooden table. Inside, a painting sits unfinished. The archway, the table, the stone path, the patio the painting — all were created by Macadam Mason. Another archway stands at the back edge of the patio, feet from where Mason was standing when Vermont State Police Trooper David Shaffer triggered his Taser Wednesday evening, striking Mason in the chest. Loved ones watched from a large picture window on the side of the house as Shaffer, and subsequently, EMTs, tried to revive Mason. Despite their attempts, Mason was declared dead upon arrival at Dartmouth-Hitchcock Medical Center. At Wednesday’s press conference, Shumlin defended state police, calling questions from the press about the incident inappropriate. Asked if the Tasering of someone with a history of seizures or other health issues was questionable, Shumlin stopped a reporter mid-question. “So what are the state police supposed to do, get a medical records check before they use a Taser?” he asked. The training, a product of 2004 legislation that appropriated $50,000 to enhance officers’ ability to respond to mental health crises, became mandatory in 2006, starting with the 82nd Basic Police Academy Class, officials say. Shaffer was in the 81st. The petition, hosted online by SignOn.org, a subsidiary of MoveOn.org, was created by Morgan Brown, a citizen mental health advocate in Montpelier, after what Brown said was an unsatisfactory response from Shumlin. In a lawsuit filed Tuesday in Orange County Superior Court, Davidonis accused Shaffer of negligence, trespassing and misuse of his Taser. Thomas Costello, a Brattleboro lawyer representing Davidonis, said the lawsuit is still in its early stages. “We haven’t served [the state] yet,” he said. But Costello says the State Police policy on Taser use fails to properly account for subjects in mental health crisis. Macadam Mason was alone on June 20, and that wasn’t unusual. The 39-year-old Thetford artist often worked at home painting and sculpting while his girlfriend, Theresa Davidonis, met with clients at her nearby hair salon. Davidonis was glad to get out of the house that Wednesday while Mason recovered from an epileptic seizure he’d had the previous day. She steered clear as she knew he could be moody and withdrawn after a seizure. In 2011, Mason had more than 10 epileptic incidents that led to spells of temperamental behavior. A recovering alcoholic, he had been sober for three years. Despite his physical and mental challenges, Davidonis’ family described him as a “teddy bear.” He especially adored Theresa’s grandson Carter. Under other circumstances, June 20 — Carter’s third birthday — would have been a happy occasion. Instead, on a day when the family should have been celebrating, Mason wound up dead after he was tased by state police. It was the first death in Vermont after a police Taser deployment. A VTDigger.org analysis of police incident reports shows that since all troopers were issued Tasers in April 2011 (a special unit has had the devices since 2006), stun guns have been fired 33 times. Of the 53 officers who have drawn a Taser, 14 troopers have done so multiple times. It is unclear, based on police records, how often troopers have fired stun guns on people with mental health problems and/or medical conditions. Green Mountain Daily, a liberal Vermont blog, highlighted some of their takeaways from the story here. Update, Sept. 30, 2012: The results of Mason’s autopsy, released by Vermont State Police this week, say Mason died because of “sudden cardiac death due to a conducted electrical weapon discharge.” Read the story on VTDigger. You are currently viewing the archives for August, 2012 at Taylor Dobbs.